Jurist, archeologist, and historian; born Nov. 30, 1817, at Garding, Sleswick-Holstein; died Nov. 1, 1903, at Charlottenburg, near Berlin. His most important work is his "Römische Gesch." (vol. i., 9th ed., Berlin, 1903; vols. ii., iii., 8th ed., 1889; vol. v., 3d ed., 1886; vol. iv. was not published). In vol. iii. he treats exhaustively the position and influence of the Jews in the Roman empire; and in vol. v. he devotes a chapter headed "Judäa und die Juden" to the spiritual and religious development of Judaism in the Persian, Greek, and Roman periods. As a member of the Prussian Diet (1873-82) and of the German Reichstag (1881-84), Mommsen belonged to the Liberal party and strongly opposed the anti-Semitic movement. In his pamphlet "Auch ein Wort ụber Unser Judentum" (1881), which was written in reply to Treitschke's arguments in "Ein Wort ụber Unser Judentum," he warmly pleaded for tolerance and humanity, and argued that the Jewish element in the German empire is a wholesome one. He was among the first who signed the declaration of German notables (Nov. 12, 1880) in which Jewbaiting ("Judenhetze") was designated a "national disgrace." The passage in his "Römische Gesch." (iii. 350), "Auch in der alten Welt war das Judentum ein wirksames Ferment des Kosmopolitismus und der nationalen Dekomposition und insofern ein vorzugsweise berechtigtes Mitglied in dem cäsarischen Staate, dessen Politik doch eigentlich nichts als Weltbürgertum, dessen Volkstümlichkeit im Grunde nichts als Humanität war," having been misunderstood and misinterpreted by the anti-Semites, was omitted by Mommsen in a later edition. 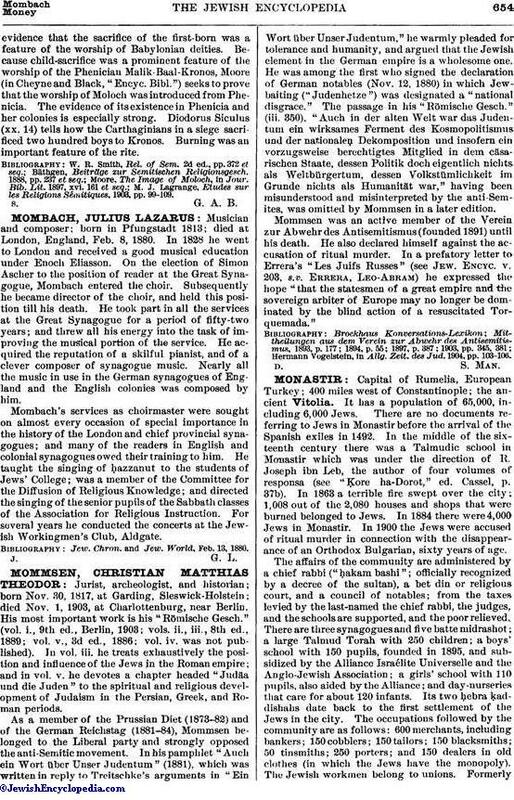 Mommsen was an active member of the Verein zur Abwehr des Antisemitismus (founded 1891) until his death. He also declared himself against the accusation of ritual murder. In a prefatory letter to Errera's "Les Juifs Russes" (see Jew. Encyc. v. 203, s.v. Errera, Leo-Abram) he expressed the hope "that the statesmen of a great empire and the sovereign arbiter of Europe may no longer be dominated by the blind action of a resuscitated Torquemada." Hermann Vogelstein, in Allg. Zeit. des Jud. 1904, pp. 103-106.